I’ve been a Braves fan ever since I was 13(ish?) and watched the ’91 World Series (which in my opinion was the best one of all time). I have no idea why I decided to watch the series, or why I chose the Braves as my team. But they’ve been my team ever since (this series is also the reason I’ve had an abiding hatred for kirby pucket [yes, i know his dead], and my love of the Braves is what spawned my hatred for the Yankees). Other than the Braves, I don’t necessarily have any teams. Being born in Michigan, it was ingrained into me my whole life (that saying makes no sense unless my life is over), to root for any team in Michigan, which I tend to do. Anyway, since I don’t really have any teams other than the Braves, I’ve just decided to pick players for now. One from each of the 4 major sports. Football: as noted below, I’ve already chosen Ricky Williams due to the awesomeness of his beard. 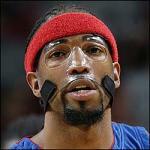 Basketball: i’ve chosen Richard Hamilton. I could say I’m choosing him because he plays for the pistons, but that wouldn’t really be true at all. I’ve chosen him because of that mask. He wears it all the time! It’s like shorts and shoes to the guy. If you’re doubting my choice, here is a picture to change your mind. Baseball: I was going to say Chuck James because it made me think of Chuck Norris, but I’ve decided (for now) to go with Chipper Jones. Mainly because his name is Chipper, but also because he’s always blowing huge bubbles with his gum, and I support that. Badminton: Raju Rai–for obvious reasons. he/she has been athlete of the year for three years running. i like rip hamilton, even if i don’t think his mask is that cool. i did think it was, but then i saw this piece they did about it and now i hate it. but i like him. not as in “he’s my favorite” because keyon dooling is. but he’s in my top 200 at least. good thing i didn’t see that piece they did about it. now i can go on loving it/him in ignorance.